While traces of a Jewish community can be found in the early 13th century, a full Jewish community established itself in Themar only in the late 1800s: in 1865, five Jewish families (eg., the Gassenheimers) moved from Bibra 20 km. east to Themar. In the following year, after a huge fire destroyed many of the houses and businesses of nearby Marisfeld, six Jewish families (e.g., the Frankenbergs) moved south to Themar. From 1866, therefore, we can talk with confidence of a Jewish community or “Gemeinde” in Themar. At any given point of time during those decades, the Jewish community probably included 90 to 100 members. A 1871 census counted a total population of 1,667 of whom 1,574 were Christians and 93 were Jews. Between 1876, when births, deaths, and marriages in the Jewish community began to be recorded formally, and 1937, 120 births were recorded. 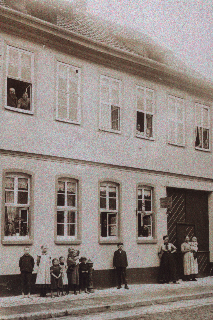 After 1870, the community had a prayer room and a school room in Hindenburgstrasse 17 (later Oberstadtstrasse No. 205 and Hildburghäuser Strasse and now Ernst-Thälmann-Strasse). In 1877, the dedication of a synagogue marked the formal constitution of a “Gemeinde”. The Themar Synagogue at Hindenburgstrasse 17, c. 1920. 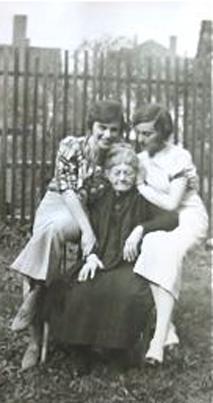 Source: City of Themar Archives. The community most likely also had a Mikva, and the dead were buried in the Jewish cemetery at Marisfeld. Moritz Levinstein became the much loved Lehrer in the early 1900s, remaining there until his death during the aftermath of the 1938 November Pogrom. 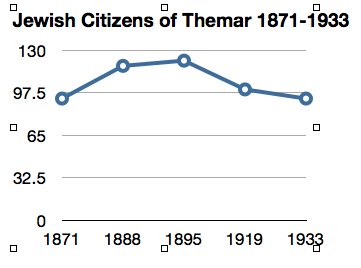 After 1933, everything changed: the number of Jews living in Themar dropped to around 72. The number continued to deline: in the census of 7 March 1938 — 8 months before the November Pogrom — only 48 still lived there. Many of the “Themarerjuden” still alive in 1933 had moved elsewhere in Germany, hoping to escape persecution and/or heighten their chances of emigration a few had already emigrated, either to other European countries, or out of Europe altogether. In autumn 1939, after the war had already started, 33 Jews still remained in Themar — of these, 6 were able to emigrate, 6 died of natural causes, and 20 were deported and murdered. Only one of the twelve people deported from Themar itself survived, 77-year old Meta Frankenberg Krakauer.